Isaiah 43:18-19 - 18) Forget the former things; do not dwell on the past. 19) See, I am doing a new thing! Now it springs up; do you not perceive it? I am making a way in the wilderness and streams in the wasteland. 1.) Change focus - We should now create and try to accomplish something new and focus to those things who will improve us with all the aspects whether if it is personal, career and especially relationship with Him. By changing focus we can move forward. 2.) Do not allow previous failures to meddle in our life - By forgetting the past doesn't mean we really have to forget those previous moments, we just need to learn from those experiences. Live a new life and avoid redoing past mistakes. 3.) Avoid depending on past victories - Don't stop dreaming! With all the accomplishments that we had previously, it is better to add more on the list, aim higher. Don't be contented with what you have and it is not bad to look for better and more victories as long as the intention is good. Psalm 51:10 - Create in me a pure heart, Oh God, and renew a steadfast spirit within me. We shouldn't be afraid about tomorrow and we should claim that this is the year of favor and victory for us. Let's renew ourselves in all the things especially with our relationship to Him. We are blessed that we have a chance to start and have a new beginning in our every failure or every chapter of our lives. This is because He is with us always. 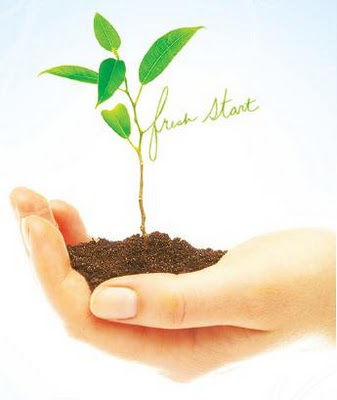 We can always have a brand new start with God if we will obey Him, acknowledge Him and follow Him. We should keep moving and move forward in the Lord as every new step will unfold more wisdom and more holiness in our lives. Let us set goals according to the word of God and start to look ahead of things. Be excited for new things that will be revealed to us in the coming days. Psalm 3:14 - I press on toward the goal to win the prize for which God called me heavenward in Christ Jesus. As for me, after all those trials that happened, I was able to move on and started to build a new me. During those times, I believed that it will end as every beginning has an end and in vice versa, every end has a new beginning. We always have a chance to improve and rewrite another chapter of our existence. This blog is actually a fresh start to deepen my relationship with Him and share to others how great He is! i like this line: "We shouldn't be afraid about tomorrow and we should claim that this is the year of favor and victory for us."